The CSA C-STAR Assessment is part of the OCF level2 scheme, and mainly used in the Greater China region. 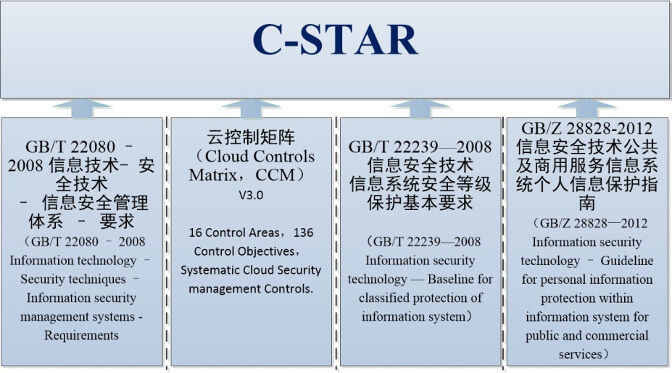 C-STAR is a rigorous third party independent assessment of the security management of a cloud service provider. The technology-neutral assessment leverages the requirements of the GB/T 22080-2008 management system standard together with the CSA Cloud Controls Matrix, a specified set of criteria that measures the capability levels of the cloud service, plus 29 related controls selected from China’s national standard GB/T 22239-2008(Information security technology — Baseline for classified protection of information system) and GB/Z 28828-2012(Information security technology – Guideline for personal information protection within information system for public and commercial services). Organizations that outsource services to cloud service providers have a number of concerns about the security of their data and information. By passing the C-STAR Assessment, cloud providers, regardless of the size of their operation, will be able to give prospective customers a greater understanding of their security management status. The C-STAR Assessment is based on GB/T 22080-2008 and the specified set of criteria outlined in the Cloud Controls Matrix, plus related requirements of GB/T 22239-2008 and GB/Z 28828-2012. The independent assessment by an accredited CSA certification body, such as CEPREI Certification Body (http://www.ceprei.org/), will assign a ‘Management Capability’ score to each of the CCM security domains (including requirements selected from GB/T 22239-2008 and GB/Z 28828-2012). Each domain will be scored on a specific maturity and will be measured against the assessors’ grid. The assessment report will show organizations how mature their processes are and what areas they need to consider improving on to reach an optimum level of maturity. Certified organizations will be listed on the CSA STAR Registry as “C-STAR Assessed”. C-STAR Assessment enables effective comparison across other organizations in an applicable sector and it is focused on strategic and operational business benefits as well as effective partner relationships. C-STAR Assessment enables the assessor to assess a company’s performance in long-term sustainability and risks management, in addition to ensuring that the company is SLA-driven, allowing senior management to quantify and measure improvement year on year. A 360º enhanced assessment giving senior management full visibility to evaluate the effectiveness of both their management system and the roles and responsibilities of personnel within the organization. A flexible assessment that can be tailored through the Statement of Applicability. This guarantees the results and measurements of assessments are both relevant and necessary in helping organizations manage their business. A comprehensive business report that goes beyond a usual assessment report and gives a strategic and accurate overview of an organization's performance to enabling senior management to the identify action areas needed. A set of improvement targets to encourage an organization to move beyond compliance toward continued improvement. Scalable to organizations of all sizes. Provides information that allows you to know where they are now and measure any improvements, internally benchmark their sites and potentially externally benchmark their supply chain to stimulate healthy competition. A visual representation of the status of a business and instantly highlights where the strengths, weaknesses, allowing clients to maximize resources, improve operational efficiencies and reduce costs. Independent reassurance to prove to senior management where the risks, threats and opportunities lie within a business. The following CSA corporate members have qualified employees to carry out C-STAR assessment. CEPREI HQ No.110 Dongguan Zhuang RD. 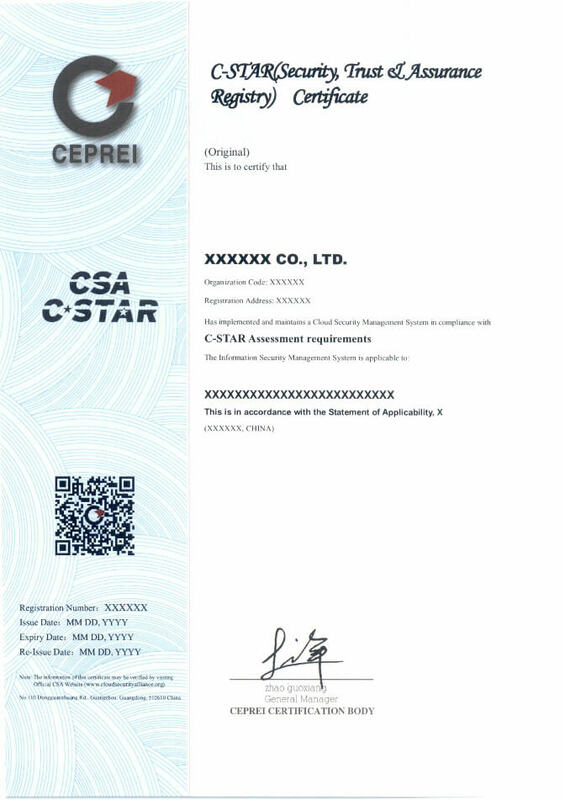 Guangzhou, P.R.China Telephone: +86-20-87236606 C-STAR@ceprei.org As a leading provider of management system certification body in China and the first Executive Member of CSA in Asia, CEPREI Certification Body Provides information security related professional services such as ISO20000 & ISO27001 certification, risk assessment, IT governance, Business Continuity Management etc. Also, newly launched C-STAR assessment scheme is provided to help our client fully understand cloud security issues they’re facing and how to put the appropriate controls in place. CEPREI Certification Body with unique legal status is a registrar authorized and accredited by national department and/or accreditation bodies home and abroad, to conduct third-party certification. It grew out of Inspection Division of China Electronic Product Reliability and Environmental Research Institute （the Fifth Electronic Institute） established in 1956, which is the first scientific research organization at national level engaged in product quality and reliability research in China. As early as 1979, CEPREI Certification Body introduced the concept of Certification into China. Ever since then CEPREI has issued more than ten thousand certificates of various types to its clients. It sets foot in all administrative regions in mainland China and other countries and regions including Hongkong Special Administration Region, Taiwan, USA, German, Holland, Denmark, Australia, Japan, Korea, Malaysia, Thailand and Singapore. As one of the most authoritative accreditation bodies in the world, America National Standard Institute-Registrar Accreditation Board (ANAB) has authorized CEPREI Certification Body to issue ISO9000, ISO14000 and ISO27001 certificates with ANAB logo since 2001. The certificate will be helpful for your products and services in improving reputation and enhancing competitiveness home and abroad. The C-STAR Assessment price is based on the ‘effective number of employees’ in the scope of registration. If a client wishes to increase the number of people in the scope of registration the difference between the fee that would be levied for the existing number of employees and the fee due for the new number of employees will be levied, prorated on the remaining duration of the certificate. No refund will be given if the number of people in the scope of registration is reduced. CSA will apply a 20% price reduction for CSA Corporate Members. The revenues from the assessments go to the Cloud Security Alliance that is the governing body of the Open Certification Framework and Level2 STAR Program. The Cloud Security Alliance is a not for profit organization that covers its cost though memberships, sponsorships and royalties generated by the third party commercial exploitation of CSA’s Intellectual Properties and brand. support the development of OCF Level 3 - STAR Continuous. Please direct them to [email protected].